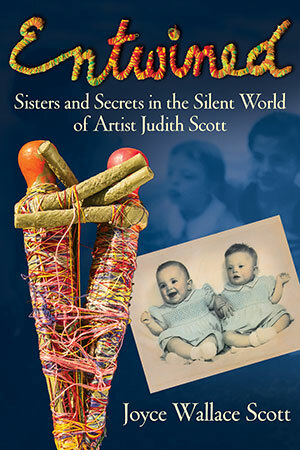 From birth, fraternal twins Judith and Joyce Scott lived as if they were one person in two bodies, understanding instinctively what the other wanted and felt, despite the fact that Judy had Down syndrome, profound deafness, and never learned to speak or sign. But this idyllic childhood of color, texture, and feeling ended abruptly when, at age seven, Judy was taken from their shared bed while Joyce slept, not knowing that the wholeness they had known was being shattered. For the next three decades, Joyce is left without her other half and must grieve unexpected loss while navigating her relationship with an emotionally distant mother—alone. Even so, her life parallels her twin’s in surprising ways. While in college, Joyce too is sent away, pressured to relinquish the secret daughter she bore in hiding to adoption. Decades later, Joyce resolves to reunite with her sister and fill their remaining years with joy. After overcoming legal hurdles to become Judy’s legal guardian, she enrolls her in an art center for adults with disabilities in Oakland, California. Judy is hesitant at first, but after two years of uninterested painting and drawing, her untapped creativity suddenly ignites when she is introduced to fiber art, and she begins carefully and intentionally winding yarn and other materials around combinations of found objects. With unflagging intensity, Judy works five days a week for the next eighteen years, producing more than two-hundred astoundingly diverse fiber sculptures. Unconcerned with her growing fame, she remains fully immersed in her artistic vision until her death in 2005. Today, Judith Scott’s work is displayed in museums and galleries around the world, in some of the most prestigious collections of contemporary art. Entwined is a penetrating personal narrative that explores a complex world of disability, loss, reunion, and the resiliency of the human spirit. Part memoir, part biography, Entwined is a poignant and astonishing story about sisters finding their voices in each other’s love and through art.